Olga was born on October 2nd, 1902. Olga 's father was Karl Anton Mueller and her mother was Maria Barbara Stocker. She had two brothers and a sister, named Charles, Otto and Onaley. She died at the age of 83 on July 4th, 1986. 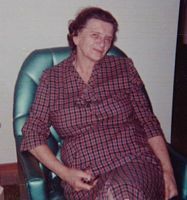 Olga 's occupation was House Wife in The House.